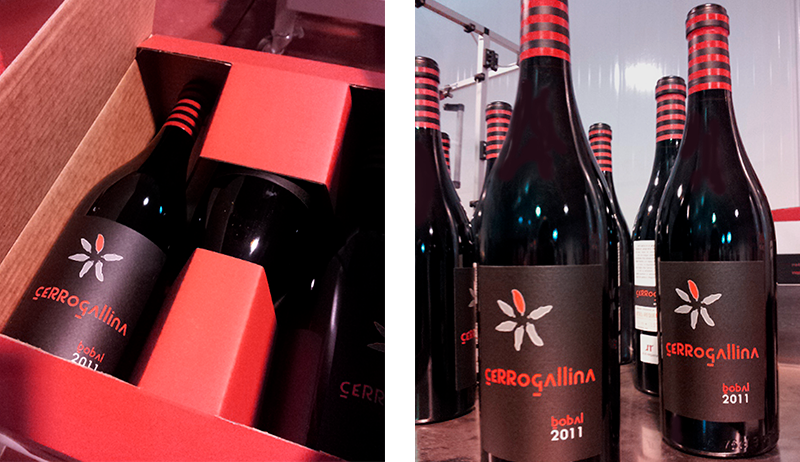 Our wine is known as Cerro Gallina, in honor to the name of the vineyard where it is created. VISUAL PHASE: very bright and intense cherry red color. OLFACTORY PHASE: in the nose, abundant ripe red and black fruits (cherry, blackberry, blueberry and blackcurrant) with hints of English jam. Ground toasted, spicy and balsamic, with touches of wild grass and blue flowers. TASTING PHASE: gorgeous in the mouth, powerful and smooth, round, balanced, and fresh, very long and rich in nuances. Perfect integration of the wood, a long and aromatic finish with a twist of caramel with milk. A splendid wine that demonstrates the benefits of well-worked Bobal. VISUAL PHASE: cherry red color very alive and open color as befits the Pinot Noir. OLFACTORY PHASE: very delicate nose, although intense, full of numerous and subtle aromatic records, dominated by notes of red fruits (wild strawberries, redcurrants and cassis), memories of pink flowers, with balsamic and vegetable nuances. Spicy and complex background contributed by the barrel. TASTING PHASE: very fresh and elegant, balanced, very long and full of nuances. With an aromatic finish and sensations that fill the mouth and lengthen it in time. Red wine freestyle with long aging in barrel and bottle. It is a special selection of the excellent harvest of 2013 that takes its owner’s name. VISUAL PHASE: intense cherry red color with ruby-tile tones. OLFACTORY PHASE: nose with abundant weight of red and black fruits in seasoned compote (cherry, blackberry, blueberry and red currant). Roasted and tarred, mineral, spicy and balsamic, with touches of broom and other wild herbs. TASTING PHASE: magnificent in mouth, powerful and unctuous while elegant, broad, round, balanced, and above all fresh, very long and rich in nuances. Perfect integration of wood, long and aromatic finish, with a memory of coffee caramel and milk. A splendid wine that demonstrates the benefits of the Bobal grape well worked in a long aging. Three new barrels of extra-fine grain French oak were selected, where the wine remained for 24 months with its lees, and a subsequent maturation in the bottle for at least another 30 months, which ended up defining its personality and uniqueness. the race of the lands of Requena. The wine was bottled without any clarification or stabilization treatment, so it is possible that over time a natural coloring matter or tartrate sediment may appear, which is a sure sign of purity and integrity. It will develop positively in the bottle over the next 10 years. Store in a cool (12 º - 14 º C), dark place in a horizontal position.